Now that I’ve gone over misconceptions of NFS on vSphere, as well as a deep dive on same subnet storage traffic, the next discussion will be around leveraging multiple subnets and using VMware’s load based teaming. Again, this article is focused on NFS traffic in regards to vSphere, but can also apply to iSCSI traffic when no binding has occurred. The lab looks nearly the same as with the same subnet discussion, but has been adjusted to use a unique subnet for each vmkernel and storage target. To demonstrate the way that vSphere routes NFS traffic on multiple subnets, I’ve created a lab using 2 NFS servers (NetApp Simulators) presenting 2 exports each, for a total of 4 exports. All traffic is on subnet 1, 2, 3, and 4 (which is 10.0.X.0/24 in my lab, where the subnet number equals the third octet) to an ESXi host running 5.0 update 1 (build 623860). The host has 2 uplinks along with 4 vmkernels. In order to consistently create traffic, I have deployed 4 of the VMware IO analyzer appliances – one on each export. This allows me to quickly simulate VM traffic going to all of the exports at the same time. 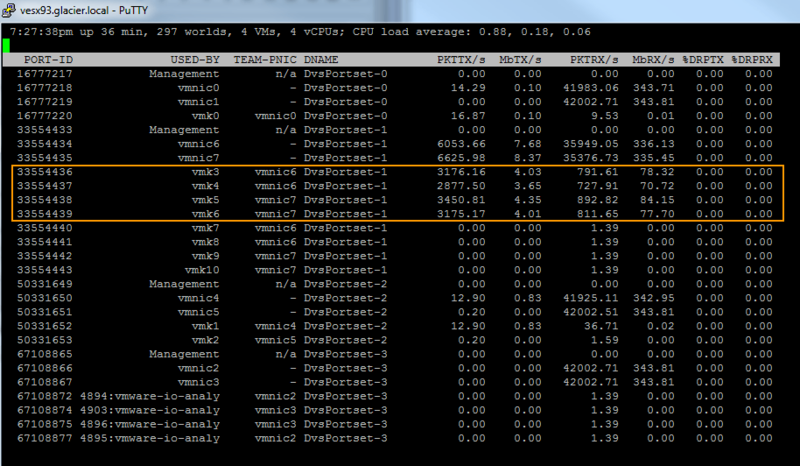 First, let’s take a look at the vDS with the new set of vmkernels on multiple subnets. To make things easier to remember, I’ve used the same 4th octet for the set of vmkernel IPs. Each vmkernel is on a unique subnet to a trunked uplink port. In practice, I’d use a unique VLAN for each subnet. However in this lab case I’m presenting all four subnets over a single VLAN. The datastores are also different, with each mapping being presented over a unique subnet. There’s really only one point I’m trying to make with using multiple vmkernels on multiple subnets: mounting each export across a unique subnet forces traffic out a vmkernel on that particular subnet. The test is simply to simulate load on all four VMware IO Analyzers to see where the traffic was routed to verify my hypothesis. If you recall from above, each appliance is mapped over a different subnet. Here is a screenshot of the load generation in the IO Analyzer. Again, the VM IP Address is for management and is not relevant for the NFS traffic. Once the simulation begins, the traffic was sent over all four vmkernels and ultimately both vmnics (uplinks). If all four analyzers are sending traffic, how do we know for sure that the traffic for a specific subnet stayed on the vmkernel for that subnet? Good question. I’ll fire up some traffic on just subnet 4 (vmkernel 6) and see what happens. Below, the ESXTOP for network shows that all traffic is properly being sent over vmkernel 6 which is on subnet 4 (10.0.4.0/24). The hypervisor follows the standard rules of routing. If you have an IP (vmkernel) on a subnet and are trying to reach a destination IP on that same subnet, the hypervisor is just going to send the traffic directly. It will not try to use the default gateway (management vmkernel). Using unique subnets to break down the traffic will utilize multiple vmkernels (one for each subnet). As long as a vmkernel exists in a subnet, the hypervisor will use it for all traffic destined to a target on the same subnet. Traffic does not cross subnets if it doesn’t have to. If you create multiple subnets and present a vmkernel in each subnet, along with a storage interface on each subnet, you can mount exports on the various subnets to do static load balancing. Create 2 portgroups, 1 for each subnet, and place a vmkernel in each portgroup for that subnet. Set the first portgroup uplink team to active / standby, forcing traffic out the first uplink. Set the second portgroup uplink team to standby / active, forcing traffic out the second uplink. Present exports (datastores) over the unique subnets as needed. With this design, you could present exports to each subnet based on known load values. If Subnet 1 is filling up with NFS traffic, storage vMotion VMs over to datastores on Subnet 2. Using multiple subnets should be the de facto method for balancing traffic when using an EtherChannel is not available (or desired). There’s really no other way to get the traffic to route over multiple uplinks and vmkernels without multiple subnets, as otherwise the traffic will continue to route over a single path. That sounds correct. The uplinks for the NFS vSwitch should be able to access any of the NFS VLANs as trunks. Hi Chris! I was wondering if you could shed some light on if this configuration is valid in a situation using a vSwitch as opposed to a dvSwitch. I am having some trouble getting this to work using a vSwitch. Thanks for your time! fantastic…thanks Chris! I will just have to figure out what I have that is misconfigured. I want to use NFS on vsphere 5.5 and I have two uplinks. Uplink A is a 10gbe and uplink B is 1gb. I want all NFS traffic on A with B as failover. I create two subnets like your pinning example, each subnet has link into the NAS and each subnet has a dedicated physical switch. But it seems like the problem is I have to make two NFS mounts — one for each subnet. If link A goes down how does vmkernel know to switch to the other subnet and mount? Perhaps with some vmkernel routes? Skynet – In your case, there’s no real advantage to using multiple subnets because you only want to use a single uplink unless there is a failure. I would use a vSwitch that houses both uplinks, create a single NFS vmkernel port, and set the port group’s teaming policy to Active / Standby. This is a great article and I thank you for this. I created a filesystem on each subnet and I have a vmk4 on one subnet and vmk5 on another. Using IOMETER I created a test hitting both filesystems hard and in esxtop I am verifying good usage for both vmk4 and vmk5 out my 10gbe nic. Great test setup and fun to follow along and test here as well. We are running esxi 5.0 u3. I did have to run export TERM=xterm in SuperPuTTY first before executing esxtop in order for it to display correctly. I can say this works as expected with an EMC VNX5200 storage array on 10gbe networking. Could we set something like this up using standard switches? If I have 2 10gbe NICs and i would just set the switches up to be trunked mode with multiple VLANs? On the vSphere side, I would configure multiple subnets to distribute nfs kernel traffic across the two links and have each vSwitch set the other 10gbe link as standby for failover. Would that work?